It possesses great powers of deception to the extent that it makes falsehood appear to be truth and vice versa. It tells monstrous lies while relentlessly and unjustly pursuing the goal of oppressing all those who resist its supreme authority. It establishes world government in the name of universal democracy but imposes, instead, universal dictatorship over all mankind. It proclaims the doctrine of free trade but establishes a usurious economy that destroys the fair market. It rips off mankind through a process of legalized theft that reduces the masses around the world to permanent poverty and destitution. It reaps far more blood-stained income in its capacity as the money-lender par excellence of the world than it deceptively doles out in face-saving aid and debt-forgiveness. It is racially, culturally and intellectually arrogant and assumes itself to be not only superior to non-Europeans but that it is the ‘white man’s burden’ to ‘civilize’ the rest of mankind. It is only when non-Europeans imitate their European way of life that they would be recognized as civilised. It leads mankind to dual feminist and sexual revolutions which bring in their wake so much sexual promiscuity and perversity that the institution of the family itself begins to fail and self-destruct. It brings about a mysterious alliance between Christians and Jews, and this is something previously considered impossible. It then uses that mysterious Euro-Christian/Euro-Jewish alliance to liberate the Holy Land, bring the Israelite Jews back to the Holy Land after 2000 years of divinely-ordained exile, and restore a State of Israel in the Holy Land. There is absolutely nothing in history that can explain the emergence of that strange and mysterious Euro-world order. Is it itself a sign of the Last Day? And can such a civilization and world-order continue to dominate the world indefinitely, or is the world a moral order with a historical process that must eventually culminate with victory for truth, justice, peace, happiness, righteousness, sexual chastity and modesty, racial fraternity, freedom, and equality? These two intellectual giants, Dr. Faruqi and Dr. Ansari, interacted with each other at the Institute with sparks flying in all directions. We, the students, were tremendously stimulated by their exchanges. Dr. Faruqi taught us the Islamic philosophy of history for two unforgettable years before he returned to Lahore. It was Dr. Ansari’s far-sightedness that opened for us those doors to Islam’s conception of the philosophy of history. Such studies are conspicuously absent from today’s Dar al-Ulum where rote learning carries the day. It is with that philosophy of history that we now attempt to explain Islam’s view of the end of history and to locate the place of the ‘Signs of the Last Day’ in the scheme of things. Let us begin by explaining that Islam conceives of the ‘end of history’ and the ‘end of the world’ as two quite different things. The ‘end of the world’ would occur with the earth, and skies above, transformed into something spatially and temporally different. Mankind would then be resurrected into the new world to face judgement. However, the ‘end of history’ would occur sometime prior to the ‘end of the world’, and when it occurs it would close the door of free choice through which human beings could accept the divinely revealed truth and be rewarded for such choice. Islam has provided a substantial body of information known as ‘Signs of the Last Day’ concerning events that would culminate with the ‘end of history’. Only Allah Most High, of course, has knowledge of when the world itself would end. The Qur’an itself has revealed that the supreme sign of the end of history would be the return of the true Messiah, Jesus, the son of the virgin Mary. And Prophet Muhammad (peace and blessings of Allah Most High be upon him) went on to inform that the Messiah’s return would herald the final triumph of truth over falsehood, and of justice over oppression and tyranny. The European war on Islam which commenced with the barbaric European crusades, and which witnessed its present foolhardy phase in the brutal and bloody western occupation and oppression of Afghanistan and Iraq, would then end with the divinely ordained destruction of the oppressor. An essentially godless and decadent western civilization would self-destruct through disease. An unstoppable Muslim army that would emerge from Khorasan (i.e., modern-day Afghanistan and neighbouring territories), would eventually sweep away every obstacle in its path as it liberates all occupied territories all the way to Jerusalem. Thus history would end with victory for Islam. The non-Muslim reader must pause to ask himself a question. What would be the consequence for him if Muhammad (peace be upon him) is indeed truthful when he declared that he is a Prophet, like unto, Abraham, Moses and Jesus (peace be upon them all), and that the Qur’an which he delivered to mankind is indeed the true and uncorrupted word of the One God? Let us note at the time of writing of this essay that the armed Islamic resistance to the oppressor in both Afghanistan and Iraq has not only emerged but is already demonstrating a capacity to stay the course for the next 20 or 30 years until victory is achieved. I doubt whether this final war of all wars would take more time than that to end. Before we turn to the rest of the essays in this book and to ‘Signs of the Last Day’ in Islam, we attempt to make a very brief comparative review of the different conceptions of the historical process, the movement of history and the end of history in Hinduism, Judaism, Christianity and, finally, in the view of modern western civilization. The Hindu view is that the movement of history is continuously cyclic. The Jewish view is linear and regressive, and so too is the Christian view. Western civilization conceives of the movement of history as linear and progressive, while the Islamic view is that it is zig-zig since it is conditioned by the triumphs and failures in a moral struggle that is waged by essentially free moral agents. Hinduism declares that the movement of history is cyclic, i.e., going round and round in circles and thus constantly repeating itself. When one cycle is completed, another one commences. In the view of many Hindu scholars today, as well as in the popular Hindu religious consciousness, the movement of history is now located at a point in time when one cycle is coming to an end and another is about to begin. Thus for the Hindu this is, in a sense, a last age, i.e., the end of this present cycle of history. While Hinduism is prepared to recognize truth manifesting itself in the form of many rivers all flowing to the same sea, the fact is that Hinduism is also firmly insistent that when those rivers all reach that common sea it is the Hindu conception of truth that is certain to prevail. The logical implication is that a cycle cannot end without validation of the Hindu conception of truth. What is that conception of truth? And what are the implications for the rest of mankind if such a conception of truth were to be validated? For the purposes of our present essay we need not look at more than one or two of those implications. Hinduism is built on the concept of a holy land, i.e., Bharat, that includes not only present-day India, but also much of the surrounding regional territory. Hinduism clings with evergreen nostalgia to a golden age in the distant past in which the gods and goddesses of Hinduism lived on earth and the truth of Hinduism dominated the then known world from that holy land. Hindus believe that Hinduism has an exclusive religious right to dominance in that holy land of Bharat, and that Hindus therefore have a religious obligation to ensure that the Hindu conception of truth prevails in that holy land. Eight centuries of Muslim rule over that holy land, followed by the partition of the holy land to accommodate the creation of a Muslim Pakistan, Muslim Bangladesh, Muslim Maldives and a Buddhist Sri Lanka, inflicted a wound on the integrity of that holy land and, by implication, on the Hindu religious consciousness. It also set the stage for a struggle for restoring the integrity of holy ‘Bharat’. History would end, in the Hindu religious view, with such a validation of the Hindu conception of truth that would require Muslim Pakistan and Bangladesh and other surrounding territories that were once ‘Bharat’ to be reabsorbed within the holy land, and that an undivided holy land of ‘Bharat’ under Brahmin Hindu political, economic and religious dominance be restored. The Brahmin Hindu conception of truth is firmly based on the belief that mankind was created unequally. The Brahmin Hindu is born into the highest caste and is thus the elite of mankind. The rest of non-Brahmin mankind are inferior to him. That belief in inherent superiority and inferiority of human beings naturally lends itself to the establishment of a system of dominance. The implication, in so far as the historical process is concerned, is that history cannot end without the political dominance of a Brahman-ruled ‘Bharat’ over all others within its sphere of influence. The political and economic life of South Asia is moving in precisely that direction. There are political implications that emerge from this Hindu conception of the end of history. The first is that the approach of an end of the present cycle would necessarily give rise to the emergence of a Hindu religious nationalism that would impact ominously on political and economic relations with non-Hindus (particularly Muslims). That is already occurring. Secondly it makes it inevitable that those Hindus with faith in the Hindu conception of the end of history would make common cause with those who are now waging war on Islam around the world. They would do so because of the perception of Islam as the major obstacle that stands in the way of Hinduism realizing its historic destiny. They would do so in order to realize the end of history that would validate Hinduism by way of restoring the integrity and undivided unity of the holy Hindu motherland of ‘Maa Bharat’ (mother India). It is precisely for this reason that India is now becoming, after USA, Israel’s most strategic ally in the world. Let us hasten to note that there are Hindus who would reject this conception of the end of history with Brahmin dominance over the rest of mankind, and would insist that justice, and that fraternity with all of mankind who reciprocate such values, must be the goal of Hinduism in the end of history. It would always be possible for Muslims to build friendship and alliance with such Hindus. In addition to the belief that history moves in cycles, Hinduism is also based on the belief that life itself is cyclical. We are born, we live, we die, and then we are reborn or we reincarnate. Prophet Muhammad (peace and blessings of Allah Most High be upon him) has prophesied an event that would occur in the Last Age that Hindus would certainly hail as a spectacular validation of the Hindu claim to truth. What is it? Cloning appear to me the first step of the road that would lead to that momentous event. After the cloning of sheep, human cloning would become a natural development. When that happens, in another twenty-five years or so, a preserveed cell of a long-dead father would be used to create his clone, and a Jinn would then speak through that clone in the voice and with the memory of the real father. Then perhaps this prophecy of the Prophet Muhammad (peace be upon him) would also be fulfilled. Hindus would certainly respond to such an event by enthusiastically embracing it as a validation of Hinduism’s claim to truth. But Muslims with knowledge would be able the recognize the fraud. The Brahim Hindu and Jewish views of the movement of history and the end of history are remarkably similar. Both the Jew and the Brahmin Hindu conceive of themselves as the elite of mankind and conceive of all non-Hindus or non-Jews to have been originally created with an inferior status. And hence both seek to establish systems of political, economic, social and religious dominance which would ensure that the elite of mankind themselves would dominate over the rest. Both cherish the memory of a golden age when their political, economic and religious dominance over all others within their sphere of influence was realized in history. Both believe in a holy land in which their respective golden ages were realized, and both believe that history cannot end without a re-realization of their respective golden ages in which they would again dominate the world around them from their respective holy lands. The Israelites were expelled from their holy land more than 2000 years ago, and they lived for that long period in sorrowful exile. But it is of momentous and historic importance that they have now returned to the very heart of that holy land to reclaim it as their own. It is significant that they accomplished that return while riding on the backs of European Jews who pursued their goal with no concern for either truth or justice. History reached its zenith in the golden age of Judaism when David and Solomon (peace be upon them both) ruled the world from Holy Israel. History after the golden age witnessed two periods of Jewish betrayal of the covenant with Allah Most High and hence, two periods of historical collapse and consequent Jewish exile from the Holy Land. The first was the Babylonian exile. The second, which commenced shortly after Jews rejected the claim of Jesus (peace be upon him) to be the Messiah and subsequently boasted that they had killed him (Qur’an, al-Nisa, 4:159), resulted in a two-thousand-year exile. Those 2000 years constituted, from their perspective, the Jewish Dark Age. The historical process is thus linear and regressive. But regression was punctuated by divine interventions which once brought the Jews back from Babylon to reclaim the Holy Land, and which once again would fulfill a Divine promise concerning the advent of a Messiah through whom Jews would re-realize the golden age when Holy Israel ruled the world. Judaism believes itself to be the dominant force impacting upon the historical process at the beginning and at the end of history. History is pre-eminently the history of Jews. But history is particularly the history of the Jews in their relationship with the Holy Land which they believe was divinely gifted to them exclusively and unconditionally, and with the holy State of Israel which once ruled the world from that holy land. History cannot end until the Jews have liberated the rest of the holy land beyond the present frontiers of the State of Israel. The Bible itself declares that the holy land stretches “from the river of Egypt to the river Euphrates” in Iraq. History cannot end until the holy State of Israel recovers control over the entire holy land, and rules the world as the ruling state one more time. The historical process cannot end without the validation of Judaism as truth. But in order for such validation to be achieved it would first be necessary for the Jews to return to the Holy Land to reclaim it as their own. This they have already done. Secondly, a State of Israel would also have to be restored. This was achieved in 1948. Thirdly, that State of Israel would have to expand to encompass the entire territory of the holy land, and the Temple of Solomon would have to be rebuilt (which means that Israel would have to destroy Masjid al-Aqsa in order to rebuild the temple). Fourthly, the holy State of Israel would have to become, once again, the ruling state in the world. This is likely to occur soon. Finally, a Jew must rule the world from Jerusalem with a claim to eternal rule and declare himself the Messiah. When Jews recognize him to be the Messiah and accept him as such, that would constitute the end of history for Judaism. Since Jews have now returned to the Holy Land to reclaim it as their own, and a State of Israel has been restored, and the temple of Solomon is likely to be re-built soon, most Jews believe that the historical process is approaching the end. So the Hindu view, like the Jewish view, is that we are now in the last stage of history. This belief that the historical process is drawing to an end has impacted on Judaism in the same way as it has impacted on Hinduism, and so we see secular nationalism being replaced in Israel by Jewish religious nationalism with all the attendant repercussions on the politics of the State. The only significant force in the world perceived to be obstructing Jews from realizing Judaism’s historic destiny is Islam. This explains the present war that is waged on Islam to remove that road-block. There are some Jews who are absolutely horrified by Israel’s injustice and oppression of the Arab Muslim and Christian peoples who lived in the Holy Land prior to the birth of the Euro-Jewish State. They have opposed the Zionist State and have supported the rights of the oppressed Muslim and Christian people in and around the Holy Land. It is very unlikely that these Jews would accept the claim of a Messiah who achieves his rule over the world through deception, lies, assassination, terrorism, injustice and oppression. It may be possible for Muslims to build friendship and alliance with such Jews. The Christian view is that all of history prior to the advent of Jesus was preparatory in nature, and that history reached its epoch when God incarnated in the person of Jesus, the ‘son of God’, the second person in the ‘trinity’. History would culminate when that ‘God’ returns to judge all of mankind on Judgment Day. The Christian view of the historical process is thus linear and regressive, but it conceives of history ending with another divine intervention that would validate the Christian claim to the truth. History is indeed the history of truth. The historical process and the movement of history, according to Christianity, were determined by the incarnation of truth in history. God, who is truth, took human form and came to live on the earth in the person of his only begotten son, Jesus, who is also recognized as the son of the virgin Mary. The fact that God appeared in history and lived on earth implied that the age in which he lived was the golden age, and that after his departure every successive age witnessed a historical regression and departure from truth. There is a consensus amongst Christians that the return of Jesus the Christ (i.e., the Messiah) is now close, and that we are consequently nearing the end of history. Many non-European Christians are persuaded by the dominant Euro-Christian argument that the birth of the State of Israel is a fulfillment of Biblical prophecy and that Christians therefore have a religious duty to facilitate the return of Jesus by giving their support to Israel and by opposing those who oppose Israel. They remain conveniently blind to the injustice, lies and deception with which so-called Biblical prophesy is being realized. Indeed the birth of Israel is itself the result of a strange Jewish-Christian marriage that also gave birth to the present world-order. As the moment of the return of Jesus draws nigh the world is already witnessing a resurgence of Christian religious nationalism impacting on Christian political thought with momentous implications. Nowhere in the world has the impact of end-time resurgent Christian nationalism made a more ominous impact on the world than in the establishment of the George Bush administration in USA. This brief review of the viewpoints of these three religions is sufficient to demonstrate that they all believe in an end to history and, further, that the end of history is close. Perhaps the foremost philosopher of history of modern western civilization is the German philosopher, Fredrich Hegel. He gave a view of the historical process that begins with a thesis. It provokes an antithesis. And these two are then reconciled through the emergence of a synthesis. The synthesis in his philosophy of history represents a higher stage of history and hence, progress. The movement of history thus witnesses constant advance. The movement of history is linear and progressive, and the latest is always the best. with their different conceptions of truth and of history, including Islam, have been synthesized and superseded by the present western dispensation, and have now become redundant and moribund. Since the modern west is secular, the implication is that religion is destined to enter the museum of history. Modern western civilization not only claims that it is the latest and therefore the best, but curiously it also claims that it is the last since it represents the final synthesis in history. They believe their civilization has come to stay and will never be surpassed. They believe the historical process has reached the climax and that the end, whensoever it comes, would validate their claim to truth. There is one philosopher of history of the western world, Arnold Toynbee, who still remains an enigma. He was a devout Christian and yet his thought was firmly planted in secular western civilization. He struggled to formulate a view of history that would accommodate the western as well as the Christian view of truth and history. His intellectual work contributed to forging the Euro-Jewish/Euro-Christian alliance that now rules the world on behalf of the Euro-Jewish State of Israel. Mankind is free to chose, either to accept the Truth and to be rewarded for such a choice, or to reject it and to pay the price for that rejection. This self-directed-will and capacity for a free choice causes the historical process to move sometimes this way, sometimes that way. Dr. Burhan Ahmad Faruqi used the term zigzag to describe the movement of history. It moves now this way, and now that – sometimes progress and sometimes regress that reflect success and failure in the moral struggle. Islam thus rejects both the cyclic view as well as the linear regressive and the linear progressive views of the movement of history. Divine intervention occurs in the historical process when Prophets are sent, and when Scriptures are revealed. Such intervention results in a Prophet inserting himself in the sweep of history and launching an effort to re-direct the movement of history so that it is restored to the straight path (i.e., Sirat al-Mustaqim). These divine interventions constitute landmarks of the historical process. The advent of Prophet Muhammad, however, witnessed the most decisive, the most comprehensive triumph of truth over falsehood ever to have occurred in history. Dr. Faruqi used the Qur’an to demonstrate Islam’s view that history cannot end without another triumph of truth over falsehood. Such an event, however, would validate the Islamic claim to truth since it would deliver a re-realization of the golden age of the Prophets, David and Solomon (peace be upon them both), when the Holy (Islamic State) of Israel ruled the world from the Holy Land, and the golden age of Prophet Muhammad (peace be upon him) who declared: “My companions are like the rain. I don’t know which shower is better, the first or the last”. Prophet Muhammad (peace and blessings of Allah Most High be upon him) has provided a description of a Last Age that would precede the end of history. Many Signs of the Last Day reveal grave events that would occur in the Last Age. These events would seem like an evil storm blowing through the world while sifting the grain (i.e., those who have rue faith) from the husk (those who have no faith). Allah Most High created that evil storm that will sweep everyone into the garbage bin of history—except those who have firm faith in the One God and in the truth that came from him. Islam declares that Allah Most High sent Muhammad (peace and blessings be upon him) as His last Prophet and Messenger to all mankind, and sent him with the Qur’an as the last divinely-revealed scripture. To the extent that he is indeed a true Prophet, and the Qur’an is indeed divine revelation, then only those who faithfully follow him, and who are guided by the Qur’an, would be able to survive the evil storm. The essays in this book attempt to locate and explain some of those Signs of the Last Day as they are already appearing in the modern world. They depict the evil storm that is already unleashed and is sweeping all but the truly faithful into the garbage-bin of history. The greatest danger to the religious way of life that has come with that storm is an epistemological attack on the spiritual heart of religion. There are misguided and evil people in this strange modern world who continuously attack and seek to demolish the spiritual heart of the religious way of life. They have already demolished the spiritual heart of Christianity, Judaism, Hinduism and Buddhism and are now targeting Islam. 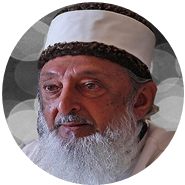 They villify authentic Sufi scholars of Islam such as my learned teacher Maulana Dr. Muhammad Fadlur Rahman Ansari, and his illustrious teacher, Maulana ‘Abdul ‘Aleem Siddiqui (may Allah Most High have mercy on them both), and falsely accuse them of being profoundly misguided to the extent of engaging in acts of Shirk. They are a people who have effectively joined the ranks of those enemies of Islam who are today waging war on Islam and Muslims around the world. They are themselves unaware that they have become instruments in the hands of a master-mind whose messianic objective is to obstruct Muslims from realizing the reality of the world today. That master-mind is Dajjal the false Messiah or Anti-Christ, who is himself one-eyed, and hence spiritually blind, and who knows that the spiritually blind cannot recognize the Signs of the Last Day. Many of the prophecies of Prophet Muhammad (peace and blessings of Allah Most High be upon him) concerning ‘Signs of the Last Day’ have been conveyed to us in symbolic language that must be interpreted in order to be properly understood. That process of interpretation in turn requires the use of the Sufi epistemology of seeing with the internal eye (i.e., internal intuitive spiritual insight). It also requires a keen observation of events as they unfold in the historical process. It was the good fortune of this writer to have been the student of an authentic Sufi Shaikh. The essays in this book are the fruit of a very humble attempt at interpretation of the historical process, and of events now ominously unfolding in the world, in the context of Signs of the Last Day. Perhaps these essays might assist others, more gifted than this writer, to understand and interpret the ‘Signs of the Last Day’ in a manner that would more conclusively demonstrate ‘Truth’ in Islam. The Ahadith (i.e., words of Prophet Muhammad – peace be upon him) quoted below are but a few of the large body of Ahadith on the subject of ‘Signs of the Last Day’. The reader must exercise constant vigilance when studying Ahadith on this subject since they must have certainly been the prime target of those whose evil mission it was to so fabricate Ahadith as to mislead Muslims and corrupt their understanding of this vitally important subject. Part of the methodology through which we can identify Ahadith of doubtful integrity is by first locating a consistent system of meaning which would explain a subject as a whole as derived from both the Qur’an and Ahadith. We can then suspend judgment in respect of such Ahadith as are not in harmony with that system of meaning. Nowhere is there greater need for such a methodology than in the study of ‘Signs of the Last Day’. This prophecy of the Last Day very clearly rules out the possibility of any peaceful resolution of the conflict between Jews and Muslims over Jewish oppression in the Holy Land and elsewhere in the world. This indicates that the European Jews and the Euro-Zionist Movement who created the State of Israel, would eventually relinquish power and control over Israel and seduce the real Jews, i.e., the oriental Jews, to replace them. It is significant that an Iranian Jew is now President of Israel. Those great lies are already coming out of the Washington, London and Tel Aviv/Jerusalem. In addition, the world is subjected to a constant barrage of lies and misinformation that permeates the western-dominated international news media. Hudhayfah ibn Usayd Ghifari narrated: “Allah’s Apostle came to us all of a sudden as we were engaged (in a discussion). He asked: What are you discussing? (The Companions) said: We are discussing about the Last Hour. Thereupon he said: It would not come until you see ten signs and (in this connection) he made a mention of the ‘smoke’, ‘Dajjal’, the ‘beast’, the ‘rising of the sun from the west’, the ‘descent of Jesus son of Mary’, ‘Gog and Magog’, and ‘landslides in three places, one in the east, one in the west and one in Arabia’ at the end of which ‘fire would burn forth from the Yemen and would drive people to the place of their assembly’. Here is a prophecy that is very clearly presented in symbolic language that must be interpreted. But the Hadith also directs our attention to al-Ihsan, or the spiritual quest, as part of the prerequisites required for responding to the ‘Signs of the Last Day’. “The slave-girl giving birth to her mistress” is a startling prophecy that can be interpreted only when one understands and penetrates the prophecies concerning Dajjal and Riba on the one hand, and Dajjal and the feminist revolution on the other. The void in respect of religious knowledge can be easily understood in the context of the attack that has already been launched on the scholars of Islam and on the institutions of higher Islamic learning. This attack on the scholars of Islam forms part of the over-all war on Islam and Muslims. I believe the mountain of gold uncovered by the River Euphrates can be understood only as a symbol for oil (black gold) and that the deaths prophesied (99 out of every 100) would occur in the wars to gain control over that oil. Perhaps weapons of mass destruction such as nuclear weapons will be used in the future.